I had a college professor whose favorite saying was “The pleasure of recognition surpasses the pleasure of surprise.” He was referring to the joy we found in recognizing a thought or a trope or a hidden reference in literature or film. It was a reminder that the pleasure in reading actually increases with a familiarity with a subject. But it got me thinking about why we enjoy romance novels when we know how they’re going to turn out. Certainly, we like to live unfamiliar settings—and no one complains about a few heart-stopping kisses—but that wouldn’t be enough to take us back to our favorites again and again. I think the reasons are deeper that that. 1) They remind us that we are all worthy of love. The heroine in a good romance novel should be likeable, but she probably isn’t perfect. She has her quirks and her faults. She has a blemished past (more so if she happens to be in one of my novels). She isn’t always the perfect example of virtue. When we see the story through her eyes, we become her, and we become invested in her happiness. When we see the heroine through the eyes of view of the hero (who probably isn’t perfect either), we get to see the reasons why those faults don’t matter and all the wonderful traits that make him fall in love with her anyway. And in both our identification with the girl and our perspective of the guy, we are reminded that there is something worthy of love in everyone, even us. 2) They reassure us that no matter how bad things look at the moment, things can still work out in the end. My favorite part of the book to read (and write) is what we call the dark night of the soul/black moment. This is where all hope seems lost, when everything is so completely messed up that nothing short of a miracle can make it right again. If we’re invested in the story and the characters, this is the part that grabs you by the insides and squeezes. (It might also be the part where I hurl the book across the room, but that’s a discussion for another post.) And yet, we keep reading, because we know that by the end of the story, the problems will somehow be resolved and the characters will live happily ever after. If you read mystery, fantasy, or literary fiction, a HEA isn’t guaranteed. But a romance by its nature always holds out hope. When we are in the middle of our own dark night of the soul, that reassurance of hope on the horizon—even if it comes through fictional means—can be the difference between giving up and pushing on. 3) They remind us of the greatest romance of all. There is something in all of us that wants to experience the feeling of being passionately pursued, of being loved beyond all measure despite our faults. This isn’t an accident any more than it is a hopeless romantic notion. It’s a desire embedded in our souls by our Creator, by the one who models the Love of which our earthly love is only a dim reflection. But it’s easy to let the doubts and difficulties of our present circumstances overshadow the knowledge that we are cherished, and that there is One who loves us where we are now. That’s what distinguishes inspirational romance so strongly from its counterparts—it not only shows the heady and exciting moments of earthly love, but points to the greatest Love of all. Now it’s your turn. Why do you read romance novels, even knowing how they will turn out? Carla Laureano is the author of the RITA® Award winning romance Five Days in Skye, as well as the young adult fantasy series The Song of Seare (as C.E. Laureano). She's an avid cook, an enthusiastic but untalented singer, and a thwarted world-traveler. She currently lives in Denver with her patient husband and two rambunctious sons. 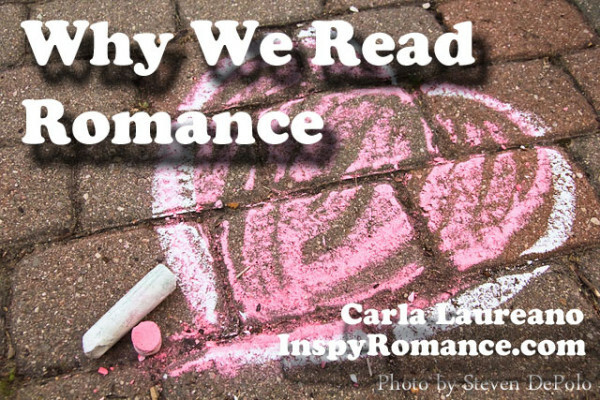 Carla, great points about why we read (and write) romance novels. For me, it’s about the journey to finding the happily ever after. If it’s not a unique journey and feels too predictable, I won’t finish reading it, though. That’s the biggest challenge I think writers of any genre have: Not only making sure we come up with something different than their previous stories, but also making sure we aren’t repeating what other authors have written before them. Take a regular, overdone plot line and twist it around, making it your very own. It’s difficult at times, but so worth the blood, sweat, and tears in the end. That’s also why it’s important to read the genre we write, so that we know what’s out there and don’t run the risk of being one of those predictable authors. So true, Andrea. I sometimes have to force myself to approach books as a reader and get lost in a story… and then if it’s something I really enjoyed, go back and analyze WHY I enjoyed it. Carla, I love that. I like to take notes along the way as I read, mostly because it’s helpful for reviewing. But I make notes about what I do or don’t like along the way, especially when it’s about the craft of writing. Those notes translate well into helping me write better stories. I read, and write, romance because of seeing people work through the obstacles and succeed. We are our own worst enemy more often than people want to admit. It’s much easier to blame outside factors than recognize our hand in it. Romances usually have at least an element of self-hinderance, but more importantly, they have the moment of realization and change that is so crucial to life.